OK, how many “hurry-canes” can we get (60mph winds and driving rain that last 20 gut-wrenching minutes) before we start paying better attention to the weather? And if you had drilled down a little, maybe there was more information that you could have used to your benefit – and an appreciation of the forecaster. And the information providers (AOL, Yahoo, etc.) all have a weather channel. Each portrays pretty much the same information that you can get by opening the newspaper over a cup of coffee at the kitchen table. And you may be surprised to know that they all likely get their weather data from the same source – the US’s NOAA – the National Oceanic & Atmospheric Administration. NOAA (noaa.gov) is part of the Commerce Department, which says a lot about what government thinks affects business the most! If NOAA’s website has any fault at all, it is how much information you can get from it! But, as NOAA says, “NOAA’s weather programs touch the lives of every American. Every day, decisions are made based on NOAA weather information – from the mundane “should I pack an umbrella today?” to the most critical and potentially life-saving.” So, “more” is putting safety first. And that is where safety must be. 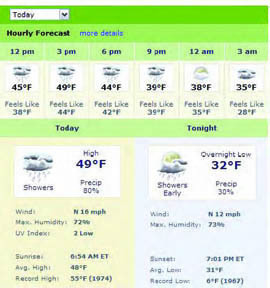 This probably looks amazingly similar to any of the weather reports you see in the paper or on your Internet provider. So, maybe we all just should go to NOAA. It is free, too! But the real answer, going back to the intro of this column, is that you want to be able to drill down, and not every weather service gives you that ability. 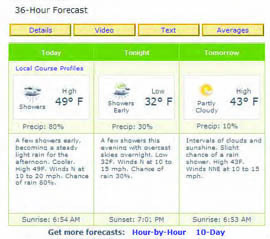 On any given day, you can get a weather report what tells you that the chance of rain is 80%, such as March 19, 2009 did. So, if you are planning to do anything outside, you might cancel or move it to another venue. But the 80% covers the whole day, i.e., there is an 80% chance that it will rain sometime today…When? Better, but what I really want to know is when the rain is likely to arrive and this still looks like all day! What happens if I drill down on hour-by-hour? Bingo! 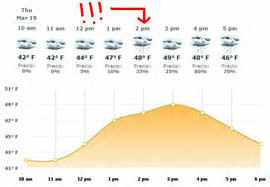 If you look at the chances of precipitation (just above the graph of temperatures), you’ll see that the chances of rain before 2pm are about 1 in 3 or less! Even by 3pm, it is even money that no rain has fallen! Drill, Baby, Drill…and how about we get some fishing in this morning?! Captain Joe Vojvodich is the Captain of the Port and Sector Commander for US Coast Guard Sector Long Island Sound. Captain Vojvodich is responsible for all active-duty, reservist and auxiliary Coast Guard personnel within the Sector. Vin Pica, Commodore for the First District Southern Region in the US Coast Guard Auxiliary, works closely with Captain Vojvodich and his staff to promote boating safety in the waters between Connecticut, Long Island and 200 nautical miles offshore. Sector Long Island Sound Command Center can be reached 24 hours a day at 203-468-4401.